Easter time, in our opinion, is one of the most spectacular times to visit Malta. It is a time steeped in tradition and ritual. It is a time of processions, pilgrimages, bell ringing, pageants and more. In fact, most towns and villages stage some event to mark Holy Week. Some villages have dedicated drama groups founded solely to produce such events during Holy Week. For more information on events during your stay here contact our reception staff. Most of the Maltese population are devout Roman Catholics and the celebrations of Holy Week and Easter are primarily of a religious character. 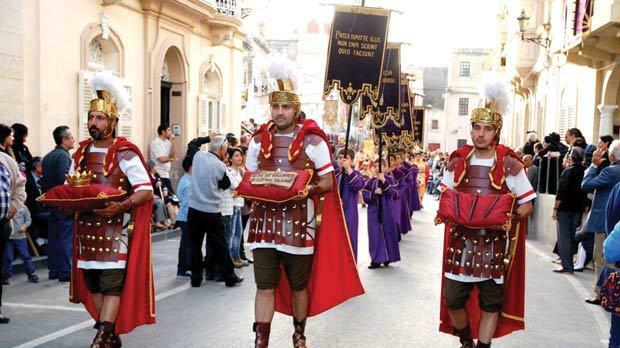 However even if you are not a religious person or a non-believer, most of the Maltese traditions, which take place during the Easter period, are interesting to participate in or to just watch. The preparations for Holy Week in Malta commence, 40 days before Easter, this time of the year, in the Western Christian calendar is known as Lent ;it is traditionally a time for reflection and repentance. Ash Wednesday, marks the start of Lent. On Ash Wednesday, during Mass, the priest uses ashes to mark the faithful’s forehead with the sign of a cross, this is meant to signify death and repentance. After evening mass, in many localities in Malta and Gozo, a procession with the statue of Christ the Redeemer, is held. The biggest pilgrimage in held in Senglea, one of the Three Cities, in the South of the island. Another important day is the feast of Our Lady of Sorrows, known by the Maltese as Id-Duluri. This feast is normally celebrated on the Friday before Good Friday. It is a very special celebration to many Maltese devotees. The faithful, walk , sing hymns and pray in religious processions behind the statue of our Lady of Sorrows. Traditionally, some of the devotees walk barefoot or drag heavy chains tied to their feet, to express gratitude for receiving a special grace. 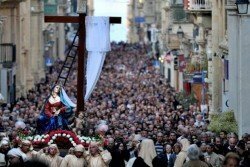 Most localities in Malta and Gozo hold a Our Lady of Sorrows procession however the most popular one, is that held by the Church of Our Lady of Jesus in Valletta. This year, Holy Week will start on the Sunday, March 20, and Easter Sunday will be celebrated on the 27th March. Holy Week starts with Palm Sunday and ends with Easter Sunday. Included within Holy Week are the religious festivals of Maundy Thursday, Good Friday and Holy Saturday. During Holy Week, Christians commemorate the Passion of Christ, who died on Good Friday to atone for the sins of mankind, and rose on Easter Sunday to give new life to all who believe. Palm Sunday is the Sunday before Easter Sunday. All the parishes in Malta celebrate this occasion. In churches across Malta and Gozo, palm leaves and olive branches are blessed with Holy Water. The faithful walk in a procession waving these blessed branches. Blessed Palm trees tied into crosses or small branches of olive leaves are given to the faithful as a blessing. 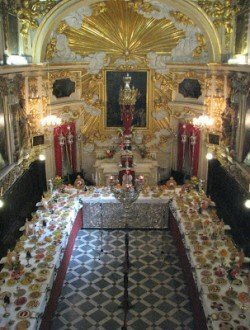 On Maundy Thursday, the eve of Good Friday, Maltese families come together to reflect on this solemn occasion. They visit the numerous Last Supper exhibitions held in many localities and combine this with the Seven visits.These sort of exhibitions are definitely worth a visit if you are visiting Malta during Holy Week. They range from model representations of the Holy Supper to more elaborate rice and pasta ‘paintings’. 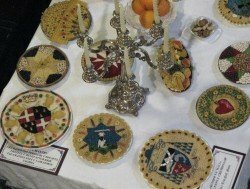 Traditionally, the food used in these displays is distributed among the needy of the parish. They take many months to produce and require a lot of work and dedication. They are usually created by volunteers. During Maundy Thursday, a mass service where the priest, representing Jesus Christ, symbolically washes the feet of twelve people, representing the twelve apostles, is held. After this mass most Maltese families gather together to do the, Seba Visti– the Seven Visits. Seven different churches are visited and special prayers are said in each. This ancient tradition is extremely popular and it is said to date back to the Romans. Although these prayers can be said until noon on Good Friday most locals perform this ritual on Maundy Thursday evening, usually combining the Seven Visits with an exhibition or two. Should you be interested in experiencing this event, we would recommend you visit Valletta on Maundy Thursday evening. Another popular event is the procession held at Girgenti. A torch lit procession starts from the village square of Siggiewi in the early evening. Pilgrims walk up Girgenti Hill until they reach the summit at Laferla Cross. As with most traditions, Maundy Thursday has a traditional food associated with it. For more information scroll down to end of this article. Good Friday is a day of mourning. No church bells are rung. No mass is held though some go to church to kiss the cross at the time Christ died, at around 3pm and to say personal prayers. On Good Friday spectacular solemn religious processions and pageants are held in numerous villages and towns. These are a combination of statues and local actors. Each of these statues represents a particular episode in the Passion of the Christ and is carried by approximately 6 to 8 bearers. It is regarded as a great honour to be a bearer amongst most locals. Between statues, locals, ranging from the very young to the old, dressed as biblical characters take part in the procession in a dignified manner. Roman soldiers feature heavily in these processions and the total number of participants in these Good Friday re-enactments is in the hundreds. So there will be lots to see. In some parts of Malta, these processions will include a number of penitents dressed in white robes and hoods; some bearing crosses, others walking barefoot, some with chains tied to their ankles. These are all acts of penance or in fulfilment of avow. 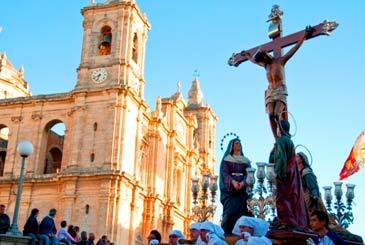 In our opinion, the most notable Good Friday processions are those of Mosta and Zebbug in Malta. The procession in Zebbug, is renowned for its extravagance and also makes use of horses. If you are in Gozo you might want to visit, the village of Xaghra. On Easter Sunday, the atmosphere is completely different to that of Good Friday. Gone is the solemnity and the mood is one of celebration and joy. The churches are open, a special mass is celebrated and the bells are rung. In the harbour towns of Vittoriosa, Senglea and Cospicua, a group of men run uphill with the statue of the Risen Christ. The most notable spectacle is held in Vittoriosa, Birgu. After mass, it is a day the Maltese spend with their family. Lavish lunches are enjoyed and, as in much of Christian Europe, the giving of chocolate eggs and Figolli; Malta’s special Easter cakes, is done. For the Figolla recipe scroll down to the end of this blog article. As with other celebrations, such as Christmas or Carnival, Easter in Malta is also strongly associated with delicious traditional food. There are many dishes such as broad beans soup (“kusksu”), Hot Cross buns and carob sweets (“karamelli tal-ħarob”). Below are ETI’s staff top 3 traditional Easter food. During Lent, many Maltese fast or perform some sort of sacrifice. Most tend to give up sweets and desserts for the duration of Lent. However Kwarezimal, Lenten biscuits, are allowed. These are delicious chewy, nutty, orange-flower flavoured localbiscuits. If you are in Malta over Lent and Easter we would highly recommend tasting them. This is the traditional unleavened loaf of bread eaten after the Seven Visits on Maundy Thursday. 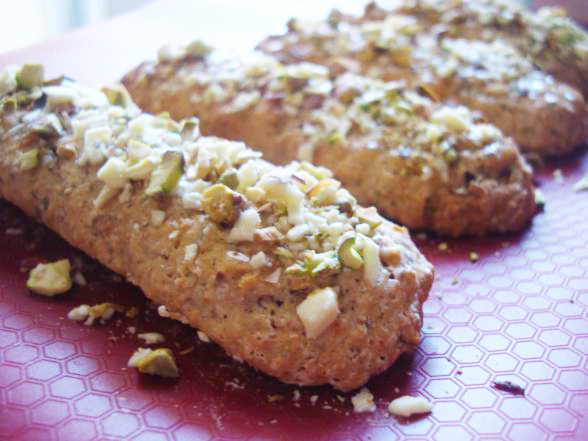 It is a ring-shaped loaf of unleavened bread made with honey and garnished with almonds and sesame seeds. Figolli are the most popular traditional Easter food. 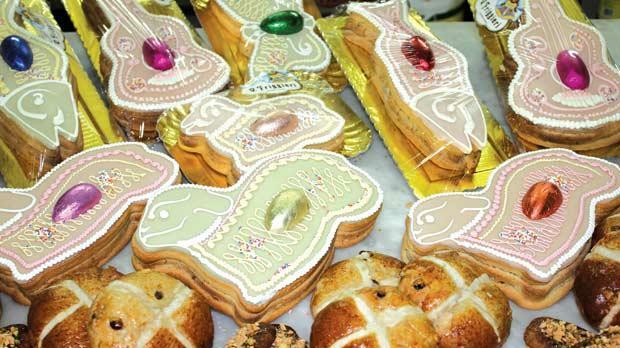 They are baked at Easter and given to friends and family, especially children on Easter Sunday. Figolli are sweet almond Easter cakes covered in icing or chocolate and decorated with half a chocolate Easter egg in colourful foil on the top.They are usually in Christian traditional shapes such as fish but recently new forms have been added to the traditional shapes such as; cars, lambs and butterflies. Click here to download the recipe in pdf form. A series of actions that are always performed in the same way, especially as part of a religious ceremony. e.g. She objects to the ritual of organised religion. A line of people or vehicles that move along slowly, especially as part of a ceremony; the act of moving in this way. e.g.The procession made its way down the hill. A journey to a holy place for religious reasons. A public entertainment in which people dress in historical costumes and give performances of scenes from history. E.g. They were filming a colourful pageant about Malta’s past. To start something, such as an organisation or an institution. E.g. They founded the drama group Stage Heroes, last September. E.g. He became solely responsible for the firm. Believing strongly in a particular religion and obeying its laws and practices. E.g. Our courses are designed primarily for adults. E.g. The meeting is scheduled to commence at noon. Repentance (for something) (formal) showing that you are sorry for something wrong that you have done. E.g. He shows no sign of repentance. E.g. a devotee of science fiction. E.g. A series of movies will be shown to commemorate the 30th anniversary of his death. E.g. He atoned for his sins. The day before an event. E.g. He has been late on numerous occasions. E.g. She had created an elaborate design. People who do not have enough money, food, etc. E.g. The charity, Oxfam, helps the homeless and the needy. The highest point of something, especially the top of a mountain. E.g. We reached the summit at noon. Sadness that you show and feel because somebody has died. E.g. The government announced a day of national mourning for the victims. E.g. Messi scored a spectacular goal. E.g. We must pay particular attention to this point. An event, a situation, or a period of time in somebody’s life, a novel, etc. that is important or interesting in some way. E.g. I’d like to try and forget the whole episode. E.g. A re-enactment of the Great Siege is held at St. Elmos. E.g. He gave a notable speech. E.g. We asked for advice from the renowned legal expert, Susan Clary. E.g. The extravagance of the evening makes me wonder how much they must have paid the event planners. E.g. They lived a very lavish lifestyle. E.g. He no longer wished to be associated with the party’s policy on education.